My relaxing reading material on the beautiful Horseshoe Bay Beach in Bermuda. 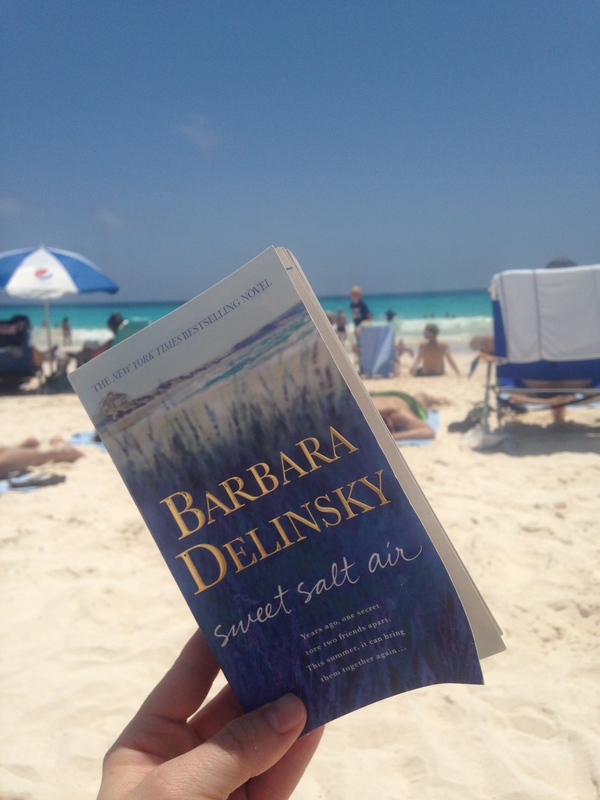 A few weeks before our recent trip to Bermuda, my husband gave me a paperback novel, Sweet Salt Air by Barbara Delinsky. Outside, the cover is nearly all wild lavender plants (an absolute favorite of mine); inside, the story is about two old friends, both writers, who reconnect after a long time apart. (I love to read any story about writers and the process of writing!) In addition, much of the story takes place during the summer months on an island off the coast of Maine. All of these things (combined with its light weight and compact size) made it seem like the perfect book to stow away in my suitcase and bring with us on our trip. These friends who have lost touch over the last ten years, are reunited to work on a cookbook together. The women research and write about recipes and locally grown ingredients — as well as the islanders to whom they belong. As they work on writing the book and meeting their deadline, they reminisce about old times and catch up on the last ten years of their lives. The longer that the friends are together, the tougher it is for them to hold back the secrets that distance has helped them keep. Pride, envy, guilt, and embarrassment have kept them both from being honest with each other, but when dire new circumstances make it impossible to hide the truth any longer, their friendship is forever changed. This novel is full of twists and turns and complicated characters. Delinsky flavors this book with the right amount of the wishes and goals of the characters, the events and consequences of their respective pasts, and the traditions and lore of the mystical island. The ingredients combine for an enjoyable and relaxing read, perfect for an afternoon on the backyard hammock — or trip to the beach in Bermuda. After finishing the book, my only wish was that Delinsky gave us some of the actual island recipes the writers include in their cookbook. They sounded delicious! < Previous Day 7 of CampNaNoWriMo and Day 2 of Teachers Write!